In Freak Shop, players each are trying to build up their mansion (card tableau) to be the scariest one in the neighborhood (i.e. having the most scary points in their mansion). Each player starts with 4 cards – in a number distribution that gives slightly better cards to those later in turn order. The rest of the 65 card deck is shuffled and turned into the shop inventory. The “Shop Closed” card is shuffled into the last 6 cards of the deck. There are 12 objective tiles in the game. They are shuffled by back color and one of each color is selected for this game – these tiles tell the players how they can score points this game. The top five cards from the deck are then revealed as the initial shop inventory. After you have taken the action, you must restock the shop – for a 4p game, this means adding a single card to the shop. If there are fewer than 5 cards in the shop after the restock, keep drawing cards until you reach a total of 5 in the shop. The game continues until the Closed Shop card is revealed when replenishing – it will be in the final seven cards of the deck. At this point, the game immediately ends and players tally up their scores. Each card can only be used once for each particular objective – but each card can be used for each objective if it fits the scoring criteria. The player with the most points wins. Ties are broken by the highest card(s) in their mansion. 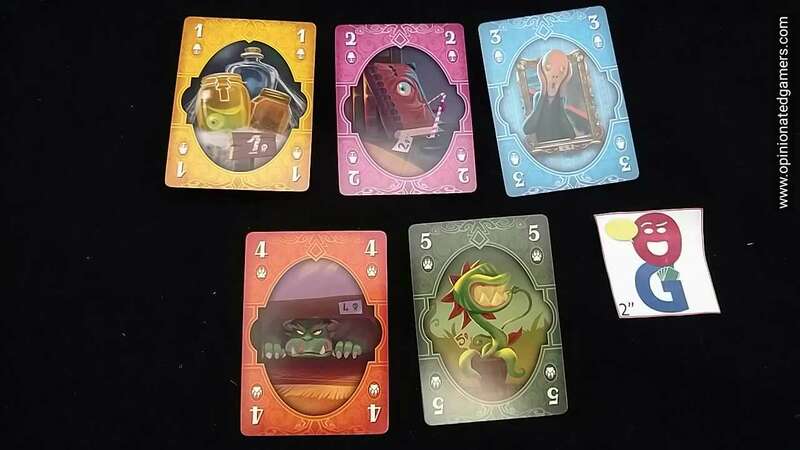 Freak Shop is a simple card game that plays quickly, is easy to learn, but feels different with each play due to the objective cards. The game is probably best classified as a set collector, though the characteristics of the sets changes in every game. Further, with three different scoring criteria in play, there are plenty of different cards that will work for you. The trick here is figuring out how to compete in two or all three of the scoring contests with the same collection of cards. The basic rules to the game are dead simple to learn as there are only two things to remember on a turn. 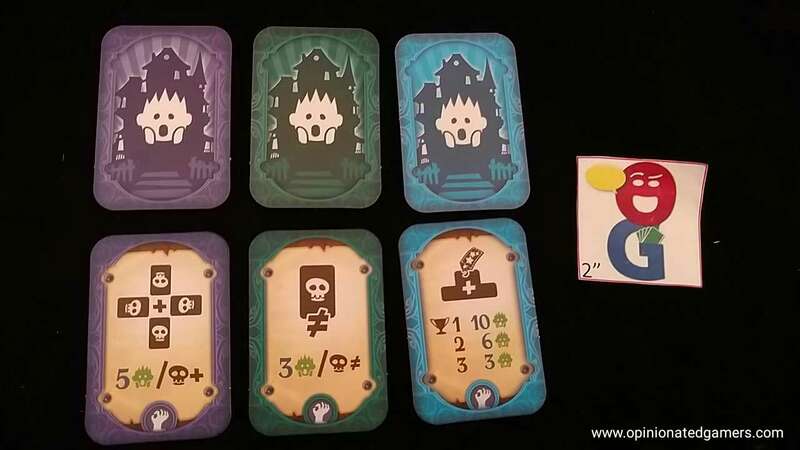 The objective cards are always face up on the table, and the rules for the specific cards can be explained at the start of the game. 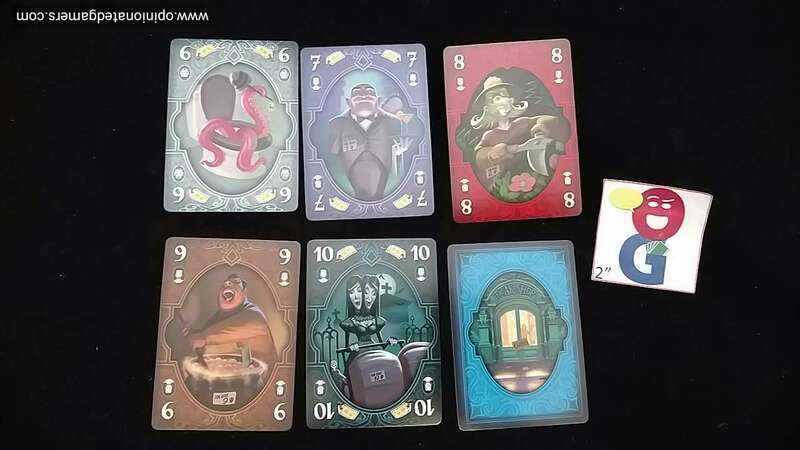 The game forces different cards to be valued as each different colored objective has a different theme. As the size of the deck is 65 – and the Shop Closed card is somewhere in the last 7 – you can usually figure on getting close to your fair share of 60, which is an easy number to fuss with in your head. Of course, the breakdown will not be even between the players – depending on the scoring cards and the particular strategies employed by players, some people may want numerous copies of the lower valued cards while others might be concentrating on fewer high valued cards. Yet others could be trying for a mix of all values. 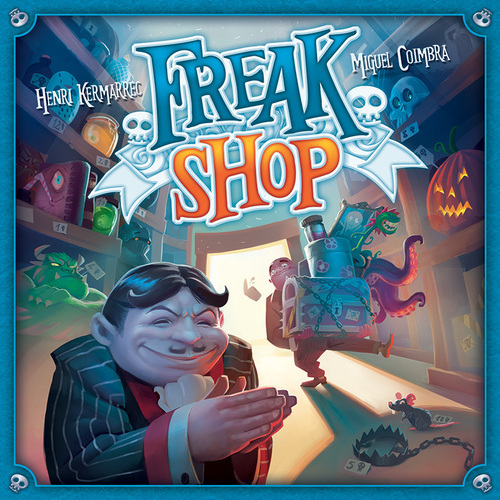 Freak Shop is a nice filler, and one that we’ve enjoyed so far. Given its small size, it’s also probably a game that will be kept around for themed game nights near Halloween or Dia de los Muertos.